I didn’t know that until I attended a meeting of the special needs parent support group last month. At the meeting, Michelle Cahoon did an excellent job of educating me and about 30 other parents on some of the amazing iPad features that people with a variety of disabilities will find helpful, both young and old. While the iPad wasn’t built for kids with special needs, it has many features that parents of kids with special needs may find helpful. Here are some of Cahoon’s recommendations. VoiceOver: This feature will read aloud items you tap on the screen. It’s great for kids who have visual or reading challenges. You can also set the speaking rate to a speed that best suits your child. What’s more, the iBooks app, which is available as a free download, is fully compatible with VoiceOver, and you can choose to have books read aloud in 33 different languages. Speak Selection: Even if you don’t have VoiceOver enabled, you can have highlighted text read to you by turning on Speak Selection. For children with visual challenges or reading difficulties, this can be an invaluable tool. Word prediction: This feature gives you a number of words that are frequently used in response to the user’s keystrokes. As you type, a word suggestion will pop up and you can select it by pressing the Enter button. Word prediction increases the speed of typing and reduces the number of keystrokes required. Wireless Braille displays: Cahoon says an old-fashioned Braille typing device costs between $3,000 and $6,000. 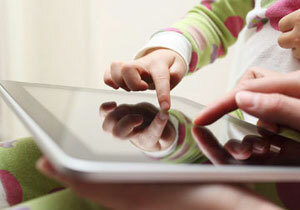 The iPad includes built-in support for Braille displays that use Bluetooth wireless technology. You can also use them to read VoiceOver output. 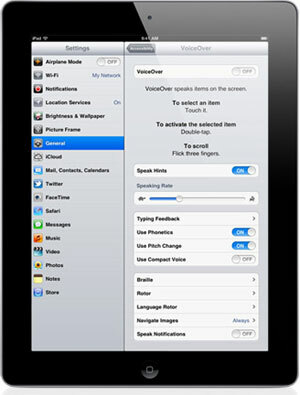 Zoom: The iPad makes it easy for you to magnify the entire screen of any application. You can zoom in and out and move around the screen by double-tapping with three fingers. Audible alerts: You can use audible alerts for incoming and outgoing mail and calendar event requests. You can also use it to confirm keyboard actions. Audible alerts can be great reminders to complete desired tasks. FaceTime: This feature is ideal for the hearing impaired. FaceTime video calling is ideal for individuals who communicate with sign language or by lip reading. Check out more Tech Tuesday posts.